Teaching Baseball Hitting is a combination of knowing Physical, Mental and Emotional Skills along with Strength, Timing, Mechanics and a 100 other elements. Let’s explore some Hitting Skills and strategies beginning with how to deal with hitting the curve ball. Unfortunately, I can speak from personal experience about the inability to hit a curve ball, which has ended more promising baseball careers, than anything other reason in baseball. Why? The MLB pitcher will develop more movement and better spot control of his fastball through the tutoring of a major league pitching coach, but the curve ball will be a totally different pitch from AAA to Majors. The pitch will be thrown with more accuracy, spotted at various locations, it’ll have a tighter spin making it harder to detect, many hitters detect the type of approaching pitch by the rotation of the seams, and the pitcher will keep tha ball hidden longer, making it harder than ever to hit. It sounds like nobody, no matter how great a hitter, can hit a major league curve ball when it’s thrown properly. Know something … you’re nearly 100% right. It can’t consistently be hit. That’s why a good major league hitter Will Not, or should I say will try not, to swing at a pitcher’s good curve ball unless he has 2 strikes, because he knows the odds are hugely against him hitting it. At best he’ll try to foul it off giving him another chance to see another pitch, hopefully not a good curve ball. So why don’t major league pitchers simply throw nothing but curve balls since it's so difficult to hit? There are probably a 100 different reasons, but the number one reason ... No major league pitcher can throw a good curve ball every time, every pitch, and it's those mistakes, the flat curve balls, which hitters pounce on, as there is no pitch easier to hit than a hanging curve ball. That brings us to our real lesson about baseball hitting ... we don’t train and practice to hit the Good Curve, we train and practice to hit the Bad Curve ball and with power. Training to hit a curve ball requires addressing numerous issues, but none more important than Early Recognition We can give ourselves an advantage on this issue by developing a baseball hitting strategy against the opposing pitcher. (1.) When facing a pitcher for the first time ask if anybody on your team has information on pitches he throws, but unless you’re playing very high level baseball where players change teams, your team mates will probably know no more than you do about the pitcher, but you won’t know if you don’t ask. (2.) During warm ups and while you’re stretching, try to position yourself where you can see the opposing pitcher warming up. (a.) Pay special attention to the types of pitches he throws, does he have an overpowering fastball which appears to be his bread and butter pitch, or does he throw a lot of breaking balls and apparently depends on his control. (b.) What pitches does he seem to have exceptional control, or little control of Today. This can be very important, even more so if you’ve been told anything about the pitcher’s tendencies, because a pitcher may be well known for his breaking pitch, but there are going to be days he won’t be able to control it and throw it for strikes much alone with pin point accuracy. It just happens even at the major league level. (c.) Your first time at bat can be exceptionally important and if you’re hitting high in the batting order, 1st through 5th, take a pitch, even 2 if the first was a ball, in order to see the pitcher’s motion. If hitting in the tail end of the line up watch what the pitcher throws to the hitters in front of you. (d.) In baseball hitting pay special attention to where his release point is, as he may throw different pitches from different release points, which could be like a red flag if you notice something like that. We’ve established that early recognition is key to hitting a curve ball, and have steps to try and gain that advantage, but there is another extremely important reason, other than the obvious of knowing what’s coming, and that is it allows you to hesitate and keep your hands and weight back in order to allow the ball to come to you. You never want to go out after a curve ball, as you will be hitting off your front foot with your weight off balance, which even if you make contact, will result in a feeble ground ball. The goal is to wait for the ball to come to you. Sometimes, unless it’s extremely exaggerated, we really may not realize we’re swinging from an unbalanced foundation. One way to check is during batting practice, ask a team mate to exam your stride and if your left knee is over or slightly forward of your left foot, you’re transferring your weight too soon and will be off balance and unable to hit the curve ball, hard or with power anyway. 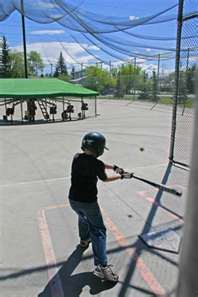 Ask for a lot of curve balls to be mixed in while taking batting practice and when not batting, stand behind the screen, if allowed, and watch the pitches come in to the batter. As with every other acquired skill, practice is the best way to learn to identify the rotation of a curve ball. Watch your own pitchers as they practice their pitching routine as the more curve balls you see, the quicker you’ll be able to identify it. Obviously the skill of the individual pitcher has the most affect on how well a curveball reacts. However, due to the rules of nature, in order for the curveball to react as intended, the ball will have certain characteristics which are basic and which we as a hitter, can recognize and capitalize on. (1.) Traditionally, curve balls which approach the plate knee level or below, will break down and out of the strike zone. Never, unless you have a two strike count, do not offer at this pitch because it’s a pitcher’s pitch. To continually swing at pitches breaking downward out of the strike zone will get you a bus ticket back home. (2.) Traditionally, a curve ball which approaches the plate higher than the knee, knee to lower belt height, will break down into the strike zone. It will depend on what grip the pitcher used whether the ball will turn down, down and away or down and in. This is the pitch you adjust to and drive hard up the middle. (3.) A hitter who can identify the seams of the approaching baseball, which I never could and most can’t, must be careful in being fooled by reading the seam rotation wrong. 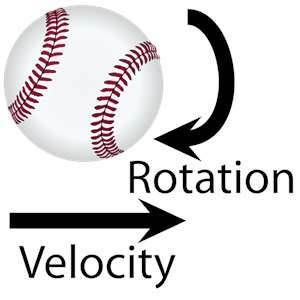 The tighter the spin or rotation of the curve ball the harder it is to identify, and relying on identifying the 12/6 rotation of the seams, is not a 100% accurate, because some curve balls are not thrown with a 12/6 rotation. This can be a double benefit to the hitter, as the speed which the ball approaches the plate indicates what the pitch is, or due to the difficulty of throwing the hard curve for a strike, might lend the pitcher to be more inclined to throw a fastball if behind in the count. Both of these indicators, visual and strategic can offer the batter an advantage. (5.) After everything is said and done and everyone has put in their opinion or tip … there is ONE best method for dealing with a curveball pitcher …. know and control the Strike Zone. Hitters envision swinging and missing a curveball, as the bat going over the top of the ball as it breaks down into the catcher’s mitt, which would have still been a strike had you not swung. That’s Not accurate. The normal curveball is very rarely thrown with the intent of actually being a strike, but only appearing to be a strike. 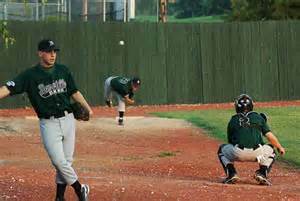 Pitchers make huge salaries getting batters to swing at balls out of the strike zone, pitches hitters can not reach or if contact is made, results in a dribbler down the first base line. In baseball hitting, especially in hitting the curveball, make the pitcher throw breaking pitches for strikes and you level the playing field giving yourself an equal or better advantage over the pitcher. There are certain things if a hitter retains to memory, which will help him in hitting and strategy. (1.) A batter looking for a fastball can adjust and hit a curve ball…A batter looking for a curve ball can not hit a fastball. (a.) When a batter is anticipating the pitcher throwing a fastball, then detects a change in speed, he can through a slight hesitation, keep his hands and weight back until the curve ball comes to him and still hit it with power and authority. (b.) When a batter is anticipating the pitcher throwing a curve ball, by the time he realizes it’s a fastball, it’s nearly impossible for the batter to get around on it. It’s like having the pitcher throwing from 30 feet instead of 60, you’re over matched. Based on this proven theory, our baseball hitting strategy, even when facing an off speed pitcher, is to go up looking for the fastball. We are confident in our ability of early recognition, we can hesitate and wait for the curve. Learning Hesitation is essential for keeping the weight and hands back when batting against breaking ball pitchers. Here’s a few simple drills which will accustom you to the feeling of a slight hesitation before swinging. (4.) Again, the hesitation of watching the ball’s flight, then bounce, helps the hitter be patient. Having the batter use a cork ball bat or a broom stick instead of a regular bat helps focus. In essence the hitter is using a baseball swing to hit a slow pitch softball type pitch, which does not normally work well. You’re trying to teach hesitation, not hitting per se’, so setting the drill up to where successfully hitting the ball is not really fully expected eliminates any temptation to develop an upper cut in their swing. (1.) The Coach, from behind a pitchers’ protective screen located about 20 feet in front of the plate, lobs the baseball underhanded to the batter. (2.) Using the arc of the ball and by mixing speeds will help the hitter wait on the ball. Instruct the hitter to always try to hit these pitches up the middle.